The Buffalo Bandits continued their early-season success picking up their sixth win of the year against the Colorado Mammoth 15-12 on Saturday night at KeyBank Center. The Bandits took an early lead and never looked back. Dhane Smith, coming off his 11-point performance against the New England Black Wolves, helped get the team going, assisting on the first two goals of the game by Shawn Evans. Jordan Durston and Chase Fraser each added a goal to their stat line to give Buffalo the 4-0 lead. Head coach Rich Kilgour praised Smith to for stepping up and drawing defenders away from his teammates. The Mammoth weren’t going down without a fight. They fought back several times to tie things up, including four-straight goals in the second quarter to knot the game at four. However, it was the Bandits ending the first half on a high note, scoring three consecutive goals and taking the 7-4 lead into halftime. To rally his players, co-head coach John Tavares offered his players a halftime pep talk. The second half, however, belonged to the Mammoth as they went on a 4-1 run. Smith’s second goal of the game kept Colorado from taking an 8-7 lead, but the Mammoth’s second comeback of the game had Buffalo on pins and needles. Realizing they needed to avoid a third comeback, the Bandits responded with three-straight goals, including one from Smith, completing the hat-trick. Colorado scored their ninth goal of the game, but Buffalo ended the third with back-to-back goals from Fraser and Matt Gilray, capping the 5-1 goal-run. Evans got his hat-trick for the game with the opening goal in the fourth quarter. Colorado attempted their third comeback of the game with three consecutive goals, but the bid fell short as Ethan O’Connor netted the empty-netter late in the game to seal the victory. Smith, Fraser and Evans all had three goals for the Bandits. Smith also added five assists. Matt Gilray had two goals while Jordan Durston chipped in a goal and three assists and O’Connor a goal and two helpers. Mitch deSnoo and Nick Weiss had single goals. Kyle Killen led the Mammoth with a hat trick and two helpers. Eli McLaughlin had a pair of goals and five assists. Ryan Lee (2G/3A), Ryan Benesch (1G/4A) and Chris Wardle (1G/2A) also had good games. 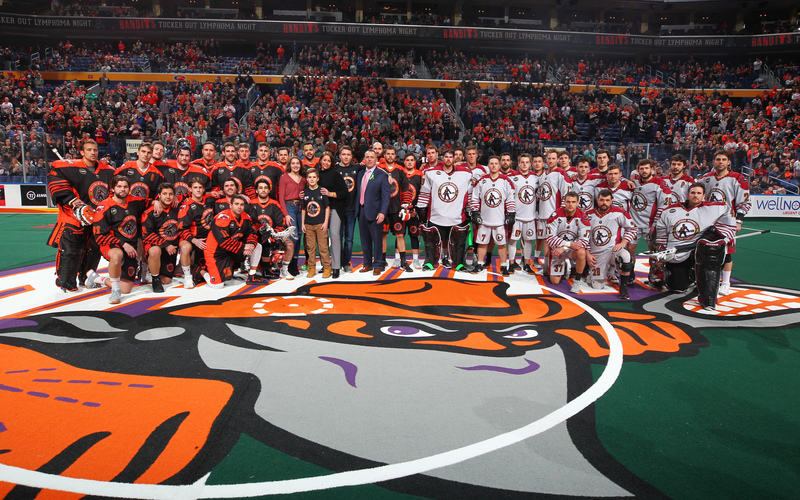 During the game the Bandits raised awareness for lymphoma with their annual Tucker Out Lymphoma Night. Tucker Williams, son of former Bandit and current Mammoth assistant coach Shawn Williams, passed away from Burkitt Lymphoma in 2014. The teams wore special “Braver than Brave”jerseys designed by Tucker’s brother Dyson. 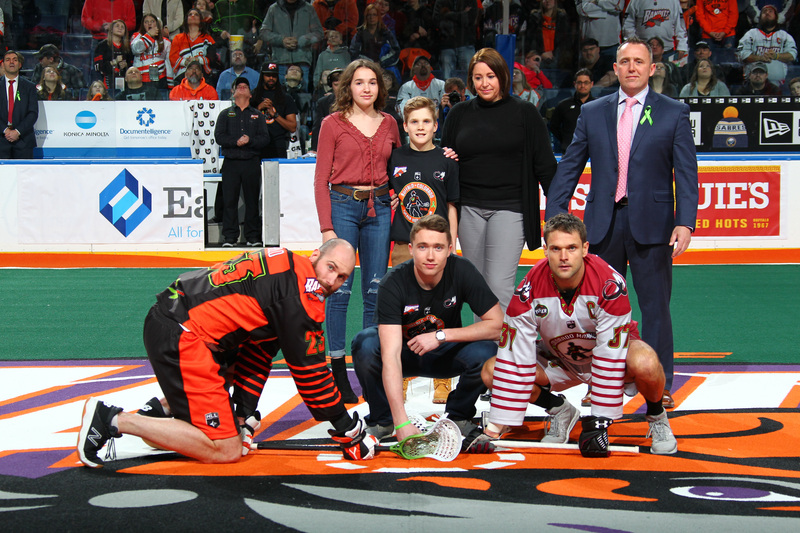 Tucker’s sister, Dylana, sang the Canadian national anthem before the game, and Shawn offered his appreciation to the teams and the Bandits’organization and fans for their continued support in a video at halftime. Smith, who played with Shawn during his first two years in the league, understood the importance the night had for the Bandits. The Bandits improve to 6-2 on the year and will travel to Georgia on Saturday for their first matchup of the season against the Swarm.